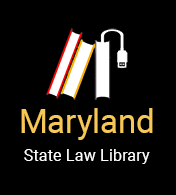 Choose one of the links below for more information about Maryland's law libraries. Hours: Monday, Wednesday, Friday, 8:00 a.m. - 4:30 p.m.
Tuesday, Thursday, 8:00 a.m. - 9:00 p.m.
Computers: Computers with internet access and printers are available for public use. Printing is $.50 per page. Wifi is available. Security: All persons entering the building must go through security. Photocopies: Copies can be made in the Clerk’s Office for $.50 per page. Computers: There is one public computer with internet access, word processing. Security: All persons entering the courthouse must go through security, including attorneys and court personnel. Hours: Monday - Friday, 9:00 a.m. - 4:30 p.m.
Computers: Computers with internet access and printers are available for public use. Printing costs $.25 per page after the first 5 pages. Hours: Monday, Wednesday, Friday, 8:30 a.m. - 4:30 p.m.; Tuesday, Thursday 8:30 a.m. - 6:00 p.m.
Photocopies: Copier available; copies are $.25 per page. Computers: Computers with internet access and printers are available for public use. Printing costs $.25 per page. Parking: There are both parking garages and parking meters nearby. The parking garages are 1-2 blocks away and costs $5 and up. Security: Library patrons must pass through a metal detector and sign in with the guard at the front desk if it is after 4 p.m.
Access: Open to the public; the library’s Hon. Harry A. Cole Self-Help Center, located adjacent to the library entrance, is also available for use by the general public. Friday, 8:30 a.m. - 5:00 p.m. Parking: Meters are located outside. Security: Follows the same restrictions as a courthouse. Hours: Monday - Friday, 8:30 a.m. - 4:00 p.m.
Computers: The library has a computer and printer with word processing and legal database access. Printing is $.10 per page. There is public Internet access. Security: Library patrons must pass through a metal detector. Computers: The library does not have computers or internet access. Parking: There are both metered and free parking located on the street. Staff: Yes, available Monday-Friday, 9:00 a.m. - 4:30 p.m.
Photocopies: Copier available, $.20 per page. Computers: The library has computers available for public use (4 for legal research, 1 in the Self-Help Center), all with word processing, internet, and legal database access. Printing is available for $.20 per page. Security: All visitors are required to pass through a metal detector. The Library is open to the public with photo i.d. during normal business hours, Monday-Friday, 9:00 a.m. - 4:30 p.m.
Use of the library is restricted to attorneys and law students only and is open Monday - Friday from 8:30 a.m. to 4:30 p.m. Paralegal studies and/or college students can obtain access to the library by appearing before the administrative judge and requesting permission. Additional Info: In the courthouse, there is a public computer located outside the information desk on the first floor for public use which has access to the Peoples Law Library website. Some legal reference materials are available at the Cecil County Public Library at 301 Newark Avenue, (410) 996-5600. You can find on-line help at the Peoples Law Library. In addition, there is a outreach site at the Buckworth Senior Center located at 214 North Street.This is a few blocks from the law library. Walk south on North Street, turn left on Main Street. Parking: There is a parking lot with no cost. Security: Library users must pass through a metal detector. Computers: Computers are available with word processing, internet, and legal information database access. Printing fees apply. Security: Library patrons must pass through a metal detector upon entering the courthouse. Parking: Street parking directly adjacent to the courthouse. Free parking nearby behind the County Office Building. Security: Library visitors must pass through a metal detector before gaining entrance. Staff: Staff is available for basic assistance from 8:30 a.m. - 2:30 p.m. Hours: Monday - Friday, 8 :00 a.m. - 4:30 p.m.
Security: Library patrons must pass through a metal detector before entering. No identification is required. Access: This library is not open to the general public. It is available on an “as needed” basis for attorney use between the hours of 8:30 a.m. and 4:30 p.m., Monday - Friday. Attorneys needing admission must report to the Circuit Court Chambers. Computers: No internet access to online legal research materials. Security: Maryland and/or Local Bar ID required. Staff: Currently unavailable; see court staff for basic assistance. Computers: Computers with internet access for use only when the library is staffed; printer available for $.25 per page. Photocopies: Copier available, $.25 per page. Parking: Street metered parking on the street and a metered parking garage located nearby. Security: Library patrons must pass through a metal detector before entering. Computers: Four public access computers; legal information database available to patrons. Wireless access is available. Parking: Free public parking located nearby. Security: Library patrons must pass through a metal detector upon entering and leaving the building. No identification is required. Members of the general public who wish to access the Law Library must first contact the Judge's secretary at 410-778-7440. Access will be granted, provided that adequate courthouse staff is available. Security: Library patrons must pass through a security checkpoint at the courthouse. Hours: Monday - Friday, 8:00 a.m. - 5:30 p.m.
Computers: The library has Internet access to Westlaw and Lexis, PACER, Bloomberg BNA and HeinOnline. Computer use is for legal research purposes; time limits are imposed if patrons are waiting. Wireless access to the internet is available to patrons who bring their own laptop computers. The library is on the third floor of the judicial center, room 3420. Parking: There is parking located on the streets around the courthouse and in parking garages located within a 2-block radius. Parking meters cost $1 per hour. There is also public transportation available through the subway (Redline, Rockville station) and Metro bus lines and Ride-On (Montgomery County) buses. Students must apply for a pass ($15 fee) each semester to gain access to the building after 4:30 p.m. Hours vary after 4:30 p.m. so call (301) 952-3438 for additional information. Computers: Computers with internet access available; wi-fi available for laptop access. Printer available $.25 per page. Parking: Parking meters and a free shuttle from the Show Place Arena. Security: Library patrons must pass through a metal detector to gain entrance. Identification is required. Computers: Available with internet access to online legal research materials; printer available. Parking: Metered parking outside of the courthouse. Computers: Library has computer with Westlaw Patron Access; printer available. Parking: Parking available on the street in front of the courthouse. Computer: Available with internet access and legal information database for public use; printer available free of charge. Parking: Parking is free and is located on the street near the courthouse, in a lot on the east side of the courthouse behind buildings opposite the courthouse and is also located on East Park Avenue, 1 block from the courthouse. Security: Identification is required to enter the courthouse except for the main entrance. All patrons must pass through a metal detector. Cell phones and other electronic devices are allowed, in accordance with the circuit court's policy on electronic devices which is posted in the lobby of the courthouse. Enter into the south wing of the Courthouse and ring the buzzer to Judge's Chambers to request access. Computers: Available with Internet access and legal information database for public use. Parking: On-street parking around the courthouse is free of charge with a 3-hour limit. Security: Persons accessing the library with permission must identify themselves to court personnel and sign in. Computers: Computer access is for attorneys only. Printing fees apply. An outreach site for public use is located in the Circuit Court Clerk's office just down the hall from the Law Library. The public library, located two blocks away, also has computers and internet access. Parking: Approximately 1 1/2 blocks away on Potomac Avenue across from City Hall there is a 5 story parking garage with a $4.00 per day maximum fee. There is also street parking located on Potomac Avenue for 2 hours at $.25 per hour. Next to the District Court (behind the Circuit Court) on Antietam Street, there are two parking choices. To the left of the District Court there is a lot for $3.00 per hour. To the right of the District Court is public parking that costs $.50 per half hour and has a 3 hour limit. Access: This library is not open to the general public. Use is restricted to members of the Wicomico County Bar Association and county employees only. Access: Open to the public; Wheelchair users please use Washington Street entrance. Staff: None, but court staff is available for basic assistance. Hours: Monday - Friday, 8:30a.m. - 4:30 p.m.
Computers: The library has computers with internet access available for public use. A printer is available free of charge. Catalog : A list of the Library Collection is available, sorted by title.